about WhatsApp’s latest update version 2.12.38 for Android that finally got the much-awaited Material Design along. Now you will soon see another update from WhatsApp Inc that will bring an option to backup your WhatsApp chats to your Google Drive. The new WhatsApp version 2.12.45 for Android will enable ‘Chat backup’ to your Google Drive account. The updated WhatsApp for Android has been made available by APK Mirror folks and isn’t yet available on official WhatsApp website or through Google Play. 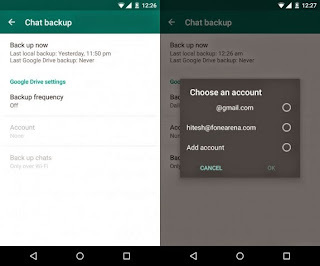 With the updated WhatsApp (v2.12.45), users will find a new ‘Chat backup’ sub-menu under Settings > Chat settings, where they will see Google Drive backup option along with Google Drive settings. From here, the chat ‘Backup frequency’ can be fixed to daily, weekly or monthly time cycle. The app allows you to ‘Back up chats’ over Wi-Fi only or Wi-Fi and cellular networks.